Chapman’s Sectional Map of the Surveyed Part of Minnesota. 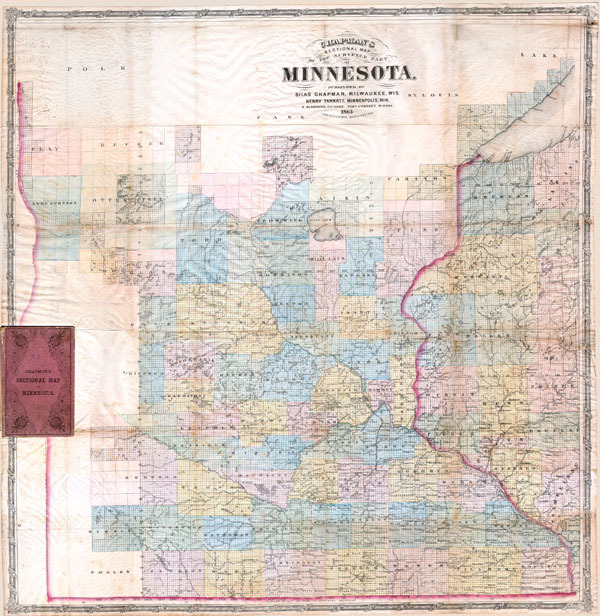 This historically important pocket map of Minnesota by Silas Chapman was made shortly after the it entered the Union in order to lay out the counties and districts of the new state. Counties in the extreme west and south are unorganized and left completely blank. Lake Superior is well mapped, as opposed to the 1856 version where it is unmapped. Excellent details throughout on a scale of 1 inch to 10 miles. Locates towns, physical features, townships and sections, and railroads. Shows all of Minnesota except northern and extreme northeastern portion. Bound in its original 16vo linen folder. Generally very good condition. Some browning and creasing along original folds. Rumsey #1667. Publisher: Silas Chapman and his associates where hired by the U.S. Government to compile a series of maps and surveys of the Midwestern territories on the even of and just after statehood – 1850 to 1870. His works predominantly focus on the states of and surround Iowa, Minnesota and Wisconsin. Chapman’s work contributed the eventual layout of counties and districts in his focus states.